Did you know that most households in sub-Saharan Africa depend on smallholder agriculture for their livelihoods? Smallholdings (farms less than five hectares) have been the major economic driver for people there and will continue to be a key source of development for the future. In fact, the UN FAO estimated that 58.8% of the total sub-Saharan workforce was in agriculture with 63.6% of the population being in rural areas. In a sector that directly employs about 175 million people, smallholder agriculture is particularly important for women, as around 70% of smallholders are female. Increasingly however, the impact of climate change means farming families are experiencing a challenges such as uncertain rainfall, water shortages and rising temperatures. All of this impacts on food production and reduces crop yields. And it’s not just food production that is suffering. The diverse forests of East Africa are under threat as they are converted to agricultural land by farmers suffering from reduced productivity. What’s the impact on smallholder farms? The biggest issue for farmers is the lack of water access. Often, the only option for them is to irrigate crops by hand from nearby ponds. This is a very labour-intensive process - for a small farm which feeds a whole family, it could take up to 3 days every week. Often, women are most affected as they need to travel long distances to bring back the water, an often dangerous journey and meaning they spend long periods away from the family home. How can solar water pumps help? The use of solar technology to address these issues has numerous environmental benefits, but also gives a much-needed financial boost to the farmers, their families and the whole community. 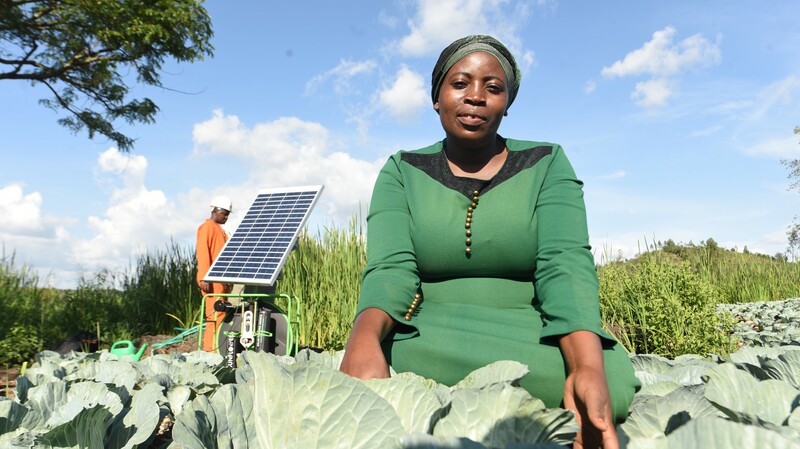 As the farms are mostly located in rural communities that are off-grid or have weak grid connection, a solar water pumping system can be the answer to these families household and agricultural needs. Hajji Ssenkere Umar is a farmer who lives in Kampala, Uganda with his wife and three of his children. They grow tomatoes, cabbages and Matoke (green bananas pounded to a mash) on his small farm, which is about the size of a soccer pitch. Hajji used to spend 150,000 Ugandan shillings a month – (15% of his salary) - to irrigate the farm by hand from a nearby pond. This job would take him 3 days every week. In 2017, they bought a solar water pump kit from SolarNow - a project funded vis Energise Africa UK based investors. They are paying in affordable instalments over 2 years, when they will own the kit outright. Sollatek Kenya raises funds to provide and install similar solar water pumping systems for Kenyan farms. Since using solar, the crop irrigation now only takes half a day per week. This is a huge labour and time saving for Hajji, which can be used to expand the crops he farms. In terms of financial benefits, after 2 years he will be able to make savings of $50 per month - $1800 over three years. He is also able to charge his neighbours to use the solar water pump which brings in an additional $11 per week and the yield from his crops are much higher. He says "Before we got solar we suffered from the kerosene smoke. It created lumps in our throats and smoke got in our noses and was everywhere,"
As well as the solar pump, the kit means they have clean, reliable solar electricity in their home. Hajji said this means his children now had more hours in which they could read and study in the evenings, giving them greater hope for the future. How can you help farmers like Hajji?